The perfect retirement gift! 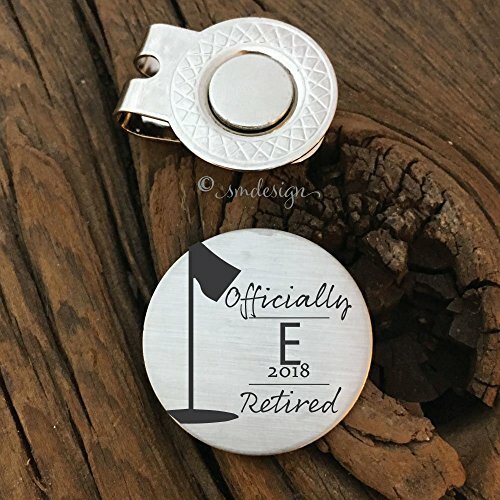 This golf ball marker has "Officially Retired", with your personalized initial, year, and a flag pole on the green on it. Includes a magnetic hat clip. Gift wrapped so that it is ready for giving. Personalization Option: You can upgrade to add a personalized message to the back of your item. Limit is 30 characters including spaces. If you prefer to have more characters or add something to the front, please contact us for a custom item. If you have any questions about this product by Sierra Metal Design, contact us by completing and submitting the form below. If you are looking for a specif part number, please include it with your message.